Wow.. I didn't have a great New Year's eve, but smalam memang besh. Dapat gak lepak ngan member-member dari nun jauh. Turun area Jalan P. Ramlee, tapi cam sunyi sepi. Sesuatu sangat. Rupanya as of semalam, memang bands dan DJ of five clubs sana da tak dibenarkan perform sebab their licenses have been revoked. Tak kisah pon.. smalam plan nak gi clubbing, sempat la jap, tapi pastuh lepak mamak beramai-ramai gak sebab malas, music cam tak happening. Borak ngumpat agik besh. Really wanna enjoy this weekend sebab come Monday, I really have a lot to do. Eh jap.. since we're on the topic of 'dead' (well not really, but I guess this is the only way I can tie it in)... any of you heard about the Notorious B.I.G. before? You know... Mo Money Mo Problems? Or after he died, I'll Be Missing You featuring Diddy (then Puffy still), wife Faith Evans and 112 on the tribute was also big - you must have heard of that at least? Well, apparently, Biggie who died ages ago - is NOT dead. If The Star will have us to believe, that is. Was flipping through the papers when I saw this. Wow... out of the grave into Zouk? 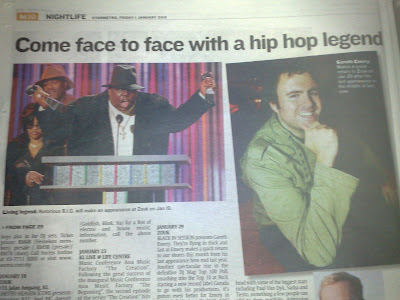 Now, the world knows Biggie is dead. 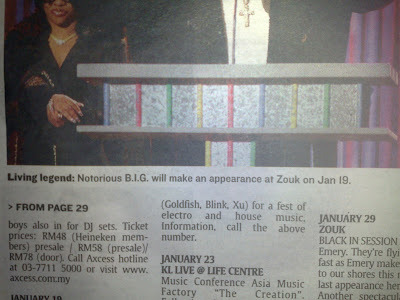 So how come The Star can report him as making an appearance in Zouk, we'll never understand. Or billing him as a 'living legend'. Obviously, this is a case of someone not knowing their music, to the point orang da pergi pon masih sangkakan hidup. Eh... nak bersiap nak kuar dulu. One more night to party before early nights come.